It is not uncommon to see couples ditching a professional DJ for an iPod in recent years. A simple YouTube search should often be enough to curb couples desire to do so, showing the dangerous pitfalls that can occur when utilizing this technology. Entertainment is among the most important part of a wedding the achieve the desired memories. 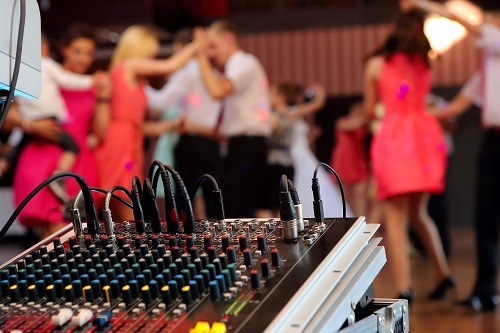 These reasons can help sway you towards hiring a professional DJ for your wedding. Using a professional DJ for your wedding reception ensures that the proper equipment is available to successfully perform your entertainment. The correct equipment can properly fill a venue with your special songs without blowing your guests away. Most professional DJs will also have microphones that can be utilized for speeches and announcements. A professional DJ has the ability to read the crowd to determine if the current songs are going over well. Playlist selection and pacing are important aspects of successfully entertaining your wedding guests. When an iPod is used, little more can be done than play through a premade playlist that may or may not be going over well. Professional DJs come with a long resume of experience performing at similar events. To be a professional DJ you have to be comfortable speaking and performing in front of large groups. This inherent value means that the DJ can make announcements calmly to help direct the evening.